The 12th Season of American Idol is about to start in few weeks. Fox announced special two-night premiere on January 16 -17, 2013 8PM ET/PT. The brand new season kicks-off revamped four-person judging panel composed of Mariah Carey, Nicki Minaj, Keith Urban and Randy Jackson. Major changes in the brand new season is caused by the poor ratings received on Season 11. Fox Entertainment President announced some creative tweaking for this season. On July 12, 2012, it was announced Steven Tyler would not be returning as a judge, after two seasons. On July 13, 2012, Jennifer Lopez announced she would be departing as a judge. On July 23, 2012, it was announced that Mariah Carey would be joining the show as a judge for the season. In September 2012, Nicki Minaj and Keith Urban confirmed to complete the judges table. Randy Jackson, the original AI judge of American Idol will also return. Ryan Seacrest will continue to host American Idol. Audition process in this season is also refreshed. "American Idol Small Town Audition Bus Tour" and "Nominate an Idol" program are introduced. Although the reactions for the return of American Idol is not that good specially for the choice of judges, Fox is still positive to get high ratings for this time. On the other hand, American Idol Season 11 winner Phillip Phillips will release his debut album "The World From the Side of the Moon" tomorrow November 19. We hope that another Filipino-blood contestant shines on AI 12th Season. Jessica Sanchez during the last season gave pride to the Philippines for being the second runner up. 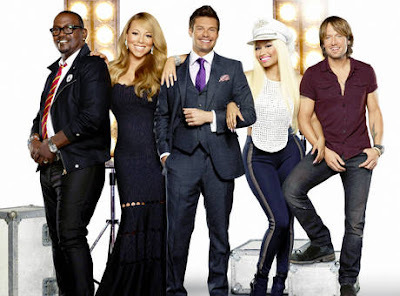 Will you tune in to American Idol Season 12?